We have two field sites in each of three river catchments: the Frome near Bristol, the Don near Sheffield and the Eden in Fife. At each site we have three blocks of five 3m x 3m grassland plots; three of the five plots have metal frames with roofs of which two are designed to replicate drought conditions on the grassland areas and the third a ‘roof’ control. The remaining two plots have no frame and receive normal (ambient) rain or snow. During October the roofs were put on the frames and the vegetation in the plots cut. This mammoth task involved staff from CEH Edinburgh and UWE as well as many incredibly hardworking volunteers who were not even deterred by the Yorkshire rain. 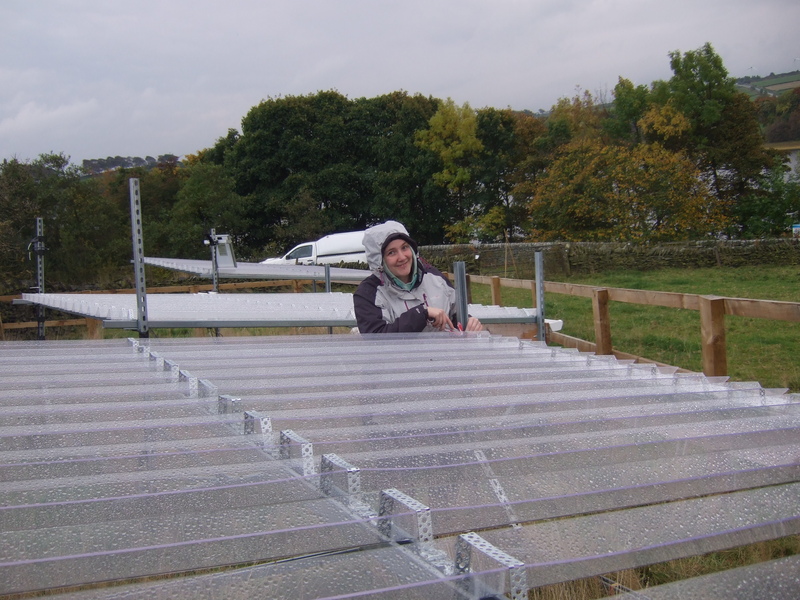 Putting the roofs on was the final stage in setting up the drought experiments. 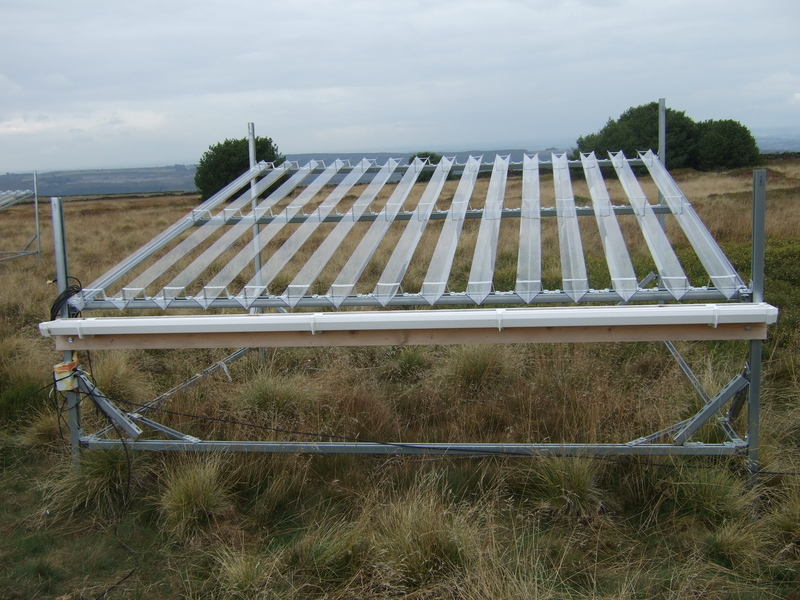 As shown in the pictures some frames have roofs with the ‘V’ upwards, these will intercept about 50% of the rainfall; the intercepted water will be carried away from the plots in pipes. These are the drought plots. Other roofs have the ‘V’ downward; these will not intercept the rain but will allow us to measure whether the roofs have an effect on the vegetation underneath it. These are the ‘roof’ controls. The remaining plots have no roofs and we will use these control plots to record how the vegetation and soil moisture behave when there is no frame or roof present. 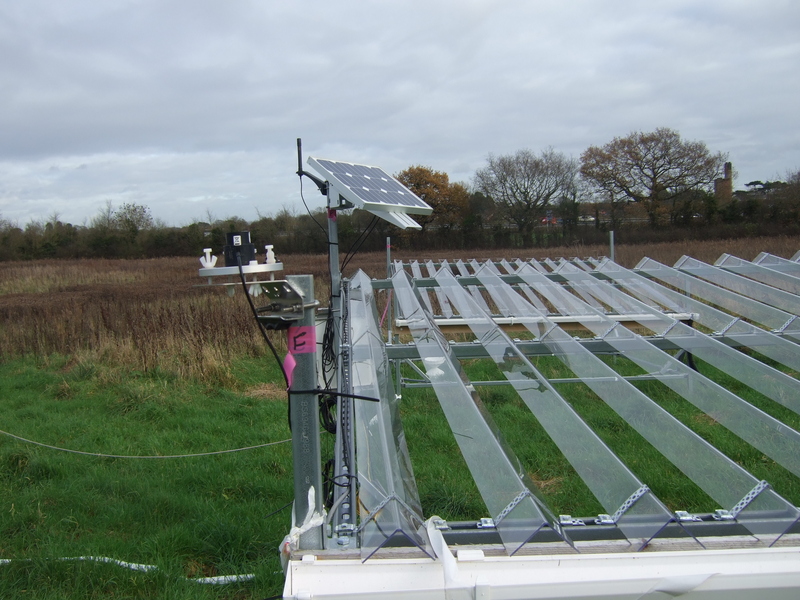 We have also been recording meteorological and soil moisture data from the plots since July to make sure that all the equipment was working. As I write Ned and George from CEH Wallingford are busy with what hopefully will be final trouble shooting and fine-tuning of the instruments. Solar panels provide the power to the data loggers that collect and store information from instruments inside and outside the frames. In the New Year we plan to survey the bryophytes (mosses and liverworts) in our experimental plots. In February we will begin recording plant phenology and vegetation height. Phenology is the study of the timing of recurring natural events such as flowering or leaf fall; it can show how plants (or animals) are responding to changes in the environment. Drought may alter the date of flowering of grasses and other plants within the grassland; this could affect insects, such as bees, that depend on those plants for nectar or pollen. Grasses do not grow so tall during prolonged spells of dry weather (you may not need to cut your lawn so often) this reduces yields of hay and causes problems for farmers who rely on grasslands to feed their animals. Finally, a big thank you to everyone who has helped us to set up the experiments; have a good Christmas and New Year and hopefully we will see you again in 2016.